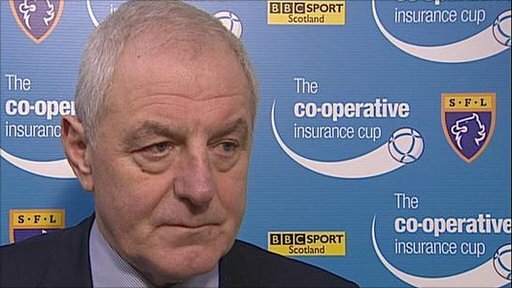 Stevie Naismith's winner ensured that Rangers ground out a victory over Motherwell to set up a Co-operative Insurance Cup final against Celtic. Maurice Edu gave holders Rangers the lead after 20 minutes with a stunning long-range strike into the top corner. Keith Lasley fired in a low drive from 18 yards for Motherwell's deserved equaliser after 66 minutes. But Nikica Jelavic set up Naismith to head Rangers' second from 10 yards with 15 minutes remaining. And the victory, which stretched the Ibrox side's unbeaten run against Motherwell to 32 games since 2002, set up an Old Firm derby on Sunday 20 March. Both managers had gone into the game by opting for experience in their starting line-ups. Lasley was back in the Motherwell midfield in place of recent signing Steve Jones, while Rangers preferred Edu and Kyle Lafferty to Vladimir Weiss and Jamie Ness. Neil Alexander - replacing Allan McGregor in Rangers' goal, as is now traditional for cup ties - was given an early touch with a Jamie Murphy drive that he handled with ease. But Rangers dominated the early possession and Steven Davis slipped the ball into the path of Nikica Jelavic, but goalkeeper Darren Randolph raced off his line to gather before the striker could connect. Edu weaved his way into the penalty box, Jelavic laid the ball into the path of McCulloch and the former Motherwell midfielder should have found the target with his drive from the edge of the penalty area. A fierce Steven Whittaker free-kick from 20 yards was heading for goal before being diverted over the crossbar by a Motherwell shoulder. The breakthrough came when Edu weaved his way past a couple of challenges and hammered a left-foot shot into the top corner. However, Motherwell were looking good in possession and were looking as dangerous as the Scottish champions. Steven Hammell's short corner was met by Tom Hateley, but the midfielder's powerful effort sliced high and wide. Hammell had a go himself with a free-kick 35 yards out, but the Hampden turf took the pace off the ball and it was easily smothered by Alexander at his left-hand post. Motherwell continued to press for an equaliser and Murphy tried his luck with an ambitious drive from 25 yards that was always rising well above the crossbar. Edu placed another low drive on target, this time saved by Randolph at his near post, before the two sides were able to gather their thoughts in the dressing-room at half-time. Motherwell had half-hearted claims for a penalty waved away by Willie Collum early in the second half when Davie Weir had an arm wrapped around John Sutton while rising to head clear. The Fir Park side took heart and forced a fine save from Alexander, the goalkeeper rising to parry clear single-handed a thunderbolt by Steve Jennings from a similar area from which Edu had scored. That was a warning Rangers failed to heed and, when Davis lost possession, Sutton played it into the path of Lasley, who fired low into the far corner from 18 yards. A McCulloch header from a John Fleck corner flew a couple of feet over from 10 yards and the substitute set up Davis for a drive that was screwed wide from 16 yards as Rangers responded. Just when it looked like a shock was on the cards, a beautiful crossfield ball from Davis found Jelavic and the striker's cross was headed in by the unmarked Naismith at the back post. Only a superb, point-blank save from Alexander prevented the tie going into extra-time when Steven Saunders rose high at the back post to meet a Murphy cross and direct a header low against the goalkeeper's knees. Murphy himself squandered Motherwell's last chance in stoppage time when he fired low straight at Alexander from 16 yards. 90:00+1:01 Steven Naismith has an effort at goal from just inside the box that misses to the right of the target. 90:00+0:48 Foul by Shaun Hutchinson on Vladimir Weiss, free kick awarded. Direct free kick taken by Vladimir Weiss. 90:00+0:13 Shot from 18 yards by Jamie Murphy. Comfortable save by Neil Alexander. 88:38 Foul by Keith Lasley on Vladimir Weiss, free kick awarded. Steven Naismith restarts play with the free kick. 88:04 Substitution Nikica Jelavic goes off and Vladimir Weiss comes on. 87:23 Free kick awarded for an unfair challenge on Lee McCulloch by Keith Lasley. Direct free kick taken by David Weir. 86:01 Steven Saunders takes a shot. Neil Alexander makes a brilliant save. 85:21 Inswinging corner taken by Stevie Hammell from the left by-line. 84:45 Corner taken by Stevie Hammell, Sasa Papac manages to make a clearance. 84:39 The ball is delivered by Chris Humphrey, clearance by David Weir. 83:13 The referee gives a free kick against Nikica Jelavic for handball. Direct free kick taken by Darren Randolph. 82:07 Steven Naismith is penalised for handball and concedes a free kick. Darren Randolph takes the direct free kick. 81:29 Effort from inside the area by Steven Saunders misses to the left of the goal. 80:55 Free kick awarded for an unfair challenge on Steve Jones by Lee McCulloch. Free kick taken by Stevie Hammell. 80:24 Steven Saunders delivers the ball, save by Neil Alexander. 79:01 Corner taken by Keith Lasley from the left by-line, save by Neil Alexander. Correction - 78:13 Substitution (Motherwell) makes a substitution, with Steve Jones coming on for Tom Hateley. 78:13 Substitution Steve Jones on for Keith Lasley. 77:52 Jamie Murphy crosses the ball, Madjid Bougherra gets a block in. 75:00 The assist for the goal came from Nikica Jelavic. 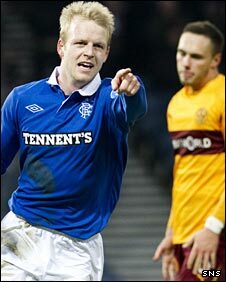 75:00 GOAL - Steven Naismith:Rangers 2 - 1 Motherwell Steven Naismith grabs a headed goal from inside the penalty area. Rangers 2-1 Motherwell. 74:21 Nikica Jelavic has an effort at goal from outside the area missing to the wide right of the target. 73:21 Shot from just outside the box by Steven Davis misses to the left of the goal. 72:10 Corner taken left-footed by John Fleck, Header from deep inside the area by Lee McCulloch goes harmlessly over the crossbar. 72:03 The ball is sent over by Madjid Bougherra, Tom Hateley gets a block in. 71:21 The ball is sent over by Maurice Edu, clearance by Stephen Craigan. 67:03 Free kick awarded for an unfair challenge on Chris Humphrey by Steven Naismith. Steven Saunders takes the direct free kick. 65:39 Assist on the goal came from John Sutton. 65:39 GOAL - Keith Lasley:Rangers 1 - 1 Motherwell Keith Lasley finds the net with a goal from just outside the box to the bottom left corner of the goal. 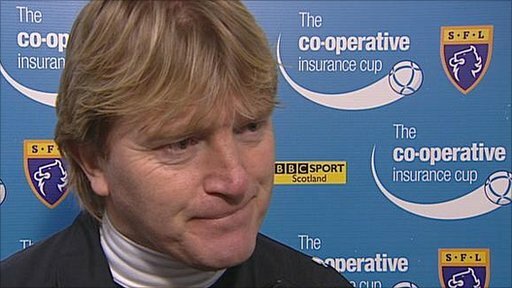 Rangers 1-1 Motherwell. 65:20 Chris Humphrey sends in a cross, Neil Alexander makes a comfortable save. 65:06 Steven Saunders sends in a cross, David Weir manages to make a clearance. 63:52 Free kick awarded for an unfair challenge on Steven Naismith by Chris Humphrey. Sasa Papac takes the free kick. 63:52 Substitution Kyle Lafferty leaves the field to be replaced by John Fleck. 59:48 Centre by Nikica Jelavic, Stephen Craigan manages to make a clearance. 58:39 Drilled right-footed shot by Steve Jennings. Save made by Neil Alexander. 54:43 Corner taken by Steven Davis from the left by-line to the near post, John Sutton makes a clearance. 54:37 Nikica Jelavic sends in a cross, Tom Hateley manages to make a clearance. 54:01 The ball is swung over by Steven Whittaker, Stephen Craigan makes a clearance. 52:34 Steven Saunders produces a cross, clearance by Sasa Papac. 50:48 Stephen Craigan concedes a free kick for a foul on Nikica Jelavic. Sasa Papac restarts play with the free kick. 49:35 Free kick awarded for an unfair challenge on Jamie Murphy by Steven Whittaker. Tom Hateley delivers the ball from the free kick right-footed from left wing, Madjid Bougherra makes a clearance. 47:59 Effort from range distance by Lee McCulloch goes wide of the right-hand upright. 46:04 Madjid Bougherra gives away a free kick for an unfair challenge on John Sutton. Free kick taken by Stevie Hammell. 45:00+0:10 The ref blows to signal half-time. 44:21 Corner taken right-footed by Steven Davis, save by Darren Randolph. 41:54 Maurice Edu has a drilled shot. Darren Randolph makes a save. 41:07 Shot by Jamie Murphy from outside the box goes over the net. 40:52 Free kick awarded for an unfair challenge on Steve Jennings by Lee McCulloch. Keith Lasley takes the free kick. 40:21 Centre by Sasa Papac, save by Darren Randolph. 39:39 Unfair challenge on Madjid Bougherra by Keith Lasley results in a free kick. Madjid Bougherra takes the direct free kick. 39:13 The ball is sent over by Jamie Murphy, clearance by Madjid Bougherra. 37:37 Nikica Jelavic is ruled offside. Darren Randolph takes the direct free kick. 37:03 The ball is sent over by Stevie Hammell, Maurice Edu manages to make a clearance. 34:57 Foul by Kyle Lafferty on Stevie Hammell, free kick awarded. Free kick taken by Stevie Hammell. 33:38 Free kick awarded for an unfair challenge on Keith Lasley by Maurice Edu. Stevie Hammell produces a shot on goal direct from the free kick, save by Neil Alexander. 33:23 Effort from 18 yards by Steven Davis. Darren Randolph makes a comfortable save. 32:43 Outswinging corner taken right-footed by Steven Davis from the right by-line. 32:38 Steven Whittaker sends in a cross, Stephen Craigan manages to make a clearance. 29:54 Effort on goal by Tom Hateley from just outside the area goes harmlessly over the target. 29:30 Short corner taken by Stevie Hammell. 29:25 The ball is swung over by Steve Jennings, David Weir manages to make a clearance. 27:19 Kyle Lafferty gives away a free kick for an unfair challenge on Stephen Craigan. Stevie Hammell restarts play with the free kick. 23:21 The ball is swung over by Chris Humphrey, save made by Neil Alexander. 21:15 The referee blows for offside against Shaun Hutchinson. Neil Alexander takes the indirect free kick. 21:09 Tom Hateley delivers the ball, David Weir makes a clearance. 20:22 Inswinging corner taken left-footed by Stevie Hammell, Steven Whittaker makes a clearance. 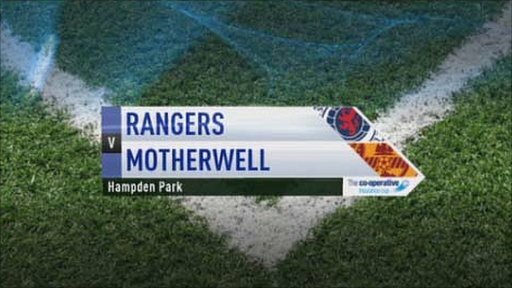 19:17 GOAL - Maurice Edu:Rangers 1 - 0 Motherwell Maurice Edu fires in a goal from outside the area to the top right corner of the goal. Rangers 1-0 Motherwell. 18:28 Corner taken by Steven Davis from the right by-line, clearance by Tom Hateley. 17:12 Foul by Steven Saunders on Nikica Jelavic, free kick awarded. Shot on goal comes in from Steven Whittaker from the free kick. 16:41 Chris Humphrey sends in a cross, John Sutton takes a shot. Save by Neil Alexander. 16:31 Jamie Murphy delivers the ball, clearance by David Weir. 15:01 Free kick awarded for a foul by John Sutton on Lee McCulloch. Madjid Bougherra restarts play with the free kick. 14:27 Lee McCulloch has shot on goal from just outside the penalty box which goes wide of the right-hand upright. 12:31 Free kick awarded for an unfair challenge on Steven Naismith by Steven Saunders. Free kick taken by Sasa Papac. 7:52 Maurice Edu fouled by Steve Jennings, the ref awards a free kick. Maurice Edu takes the free kick. Correction - 4:47 Effort on goal by Lee McCulloch from outside the box goes harmlessly over the bar. 4:47 Shot by Lee McCulloch from outside the box goes over the net. 1:03 Jamie Murphy has a drilled shot. Comfortable save by Neil Alexander.